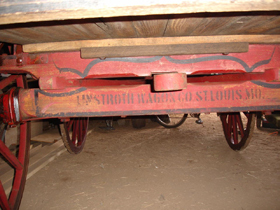 "Henry Linstroth's brand was one of the region's oldest..."
Using an image of a strutting peacock with a wide tail fan, the Linstroth company promoted itself as “The Pride of St. Louis.” They were well known, especially in the South and Southwest regions, for their expertise in manufacturing stake, farm & log wagons. 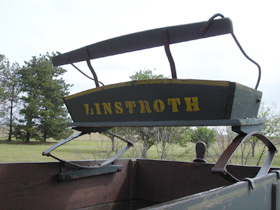 Like any farm equipment or vehicle manufacturer today, Linstroth was quick to highlight the superiority of its products over others. 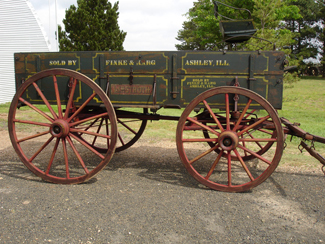 Among the features touted was the use of clear, straight grain hickory for axles… wheels boiled in linseed oil before being painted…. white oak hubs…. 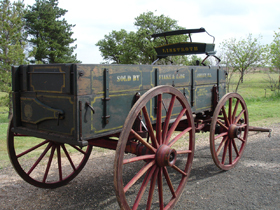 and tires set hot by hand. 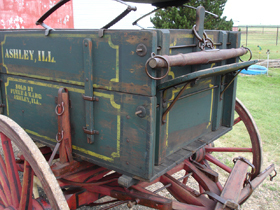 They also trussed the underside of each axle with a flat strap of iron for additional hauling strength and structural support.One of the curious traits of Linstroth is that the gears were often through-bolted and not clipped.